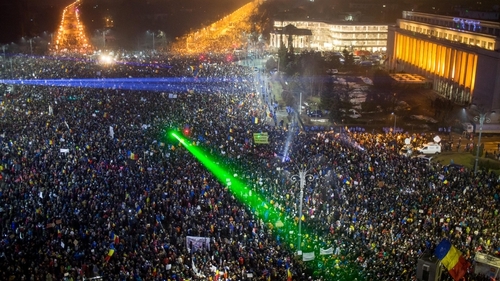 An estimated half ­a million Romanians took to the streets last night in another night of protests, with many calling on the government to quit even after it scrapped the corruption legislation that sparked the week of public outrage. Prime Minister Sorin Grindeanu stood firm, however, saying his government, which has barely been in office a month, "has a responsibility to the people who voted for us" and would not resign. The last six nights of noisy protests thronging cities and towns around the country have been the biggest outpouring of public anger since the toppling and summary execution of communist dictator Nicolae Ceausescu in 1989. The object of public anger is an emergency decree passed last Tuesday night which critics at home and abroad feared marked an alarming retreat in the battle against corruption, long the scourge of the EU's second­ poorest country. Mr Grindeanu's cabinet earlier yesterday repealed the decree, but this failed to assuage protesters, many of them chanting "resign! resign!" as they waved flags, brandished signs and blew whistles and plastic horns in the national colours. The government decree, which had been scheduled to enter into force on 10 February, was to make abuse of power a crime only punishable by jail if the sums involved exceeded €44,000. The government still also aims, via a separate decree to be reviewed by parliament, to free some 2,500 people from prison serving sentences of less than five years. Mr Grindeanu's Social Democrats (PSD) have argued the measures were meant to bring penal law into line with the constitution and reduce overcrowding in prisons. But critics see the moves as a brazenly transparent attempt to let off the many PSD officials and lawmakers who have been ensnared in a major anti-­corruption drive of recent years. That push saw almost 2,000 people convicted for abuse of power between 2014 and 2016, and a serving prime minister, five ministers, 16 lawmakers and five senators go on trial. Critics say that one beneficiary - although he himself denied this - would be Liviu Dragnea, the powerful head of the PSD who helped the party win a resounding election victory only in December. Mr Dragnea is already barred from serving in government because of a conviction for voter fraud, and he is currently on trial for alleged abuse of power. A defiant Mr Dragnea yesterday accused unspecified shadowy forces of instigating the demonstrations. "The organisation of these protests and their scale show that this is a political gathering. Who is organising this? Hard to say but I hope that the state institutions have this information," he said. "I reproach myself for not having understood that this is a much better organised plan than a simple spontaneous movement," he told the channel Romania TV.